Anyone out there collecting period art to aid in their studies about arms and armour and/or WMA? I've been adding more things like that lately to my library and wanted to see what others out there recommend. I have a facsimile of the Maciejowski Bible and a book showing many of the drawings from a 14th century Bible from Naples. I also have 3 books of hours: The Visconti Hours, The Tres Riches Heures of Jean, Duc de Berry, and the Rohan Master Book of Hours (has nothing to do with LOTR ). I also have 2 books on medieval art and/or illuminated manuscripts, plus 6 books on brasses. Plus the Mark Rector Talhoffer book and the I.33 facsimile. Looking through these has been very interesting. Everyday life is well-represented as are military scenes. There are some nifty falchions that are a little different than what we see in surviving examples. Plus other neat stuff and some weird stuff. Anyone else out there as into this stuff as I am? What do you recommend? Almost half of my library is made up of art books, most of which are full of historical arms, armour, and costume references. One of my favorites is a book of the woodcuts of The Triumph of Maximilian I, a series of prints from 1512 commemorating the Holy Roman Emperor. I also have a book of early Greek vase paintings, full of depictions of helms, shields and other arms. I have a book of Dutch Baroque art with many fine, sometimes armed, portraits, and a book of Albrecht Durer's works. Durer is one of my favorite references for 15th and 16th century costume and arms, he is meticulous in detail and has an extensive body of work. The manuscript facsimiles you mentioned are all on my wishlist, especially The Tres Riches Heures of Jean, Duc de Berry. Illuminated manuscripts are a favorite of mine, but the only books I have specifically on them are a book of early Irish illumination which is largely abstracted animal and knotwork motifs, and an excellent booklet of paintings from an early 14th century manuscript of the Apocalypse. This one was printed by the Met in the form of an engagement calendar on their 100th anniversary, and it does not refer to the manuscript by a specific name, other than to say it is an Apocalypse of circa 1320. Hey Chad, what's the name of the Naples Bible book? "The Illuminated Naples Bible". It's a Crescent Books publication, where many of the others are George Braziller. I am starting my collection; I have a copy of "In Service of the Duke", and the Old Testament Miniatures facsimile that you have as well. I also recently acquired a rubbing of an English monumental brass of Saint George (about 5 feet tall), which is shrink packaged and framed. One of these days I will get a picture of it if anyone is interested. I wish I had some recommendations, but as I get all of them here I don't think I have anything to add to the mix. But these images really do not give the book justice. The huge full color photos show wonderful details of the armour, weapons and clothing. I would also throw in "The Prayer Book of Charles the Bold", "Venus and Mars, the World of the Medieval Housebook" and most of the large and expensive art books that you stumble across. I have found art books focusing on Hans Memling, Rogier van der Weyden, and a collection of "the Flemish primitives" in my local bookstore. All of them had an "ooh, that's how that is supposed to look!" moment. Yeah, I really want that one. I just haven't found the money for it yet. Oh, yeah. I don't know how many hundreds of images I've gotten from the Imareal site. Fantastic resource. Dover's Dürer book is a great bargain, as is their "Medieval Arms and Armor," which includes drawings after originals. "Venus and Mars" is excellent. I often refer to "Four Gothic Kings" because it includes many of the late 15th c. color miniatures from Froissart's Chronicles (as does The Great Warbow). My wife has a large art historical library, so I have that at hand, too. Edward Hamilton (bookseller) is a good source for inexpensive artist the thematic monographs. This reminds me--I was recycling on campus a few weeks ago and noticed some photo slide pages and slipcased binders in a trash dumpster. Curiosity got me and I discovered that somebody had thrown out many hundreds of teaching slides on the subject of architecture and historical costume. Some of the slides were Ektachrome, faded to a lovely pink and fit only for the dumpster. But a multivolume set of costume details from historical artwork were on Kodachrome and as fine today as when they were made. Cranach, Dürer, Bruegel, Caravaggio, etc.--in five or six slipcased volumes. Some of it's familiar but there are some new discoveries, too. I'm going to box up the arms and armour stuff and send it to Scancafe this fall. The Triumphal Arch of Maximilian By Durer and others. It's the entire arch, or rather the series of woodcuts depicting it, in a large format book. Paperback, but hey. The back of the pages is blank so that if you want you can take them out of their binding and reconstruct the entire arch. Now, the Triumph in particular can get fantastical or delieberately anachronistic, but in general both are a wonderful treasury of images of arms and armour (and outrageous landscknecht clothing) in the second decade of the 16th century in the Holy Roman Empire. I'm very pleased to get this book, though. Another great source to daily life in the 14th century is Gaston Pheobus' Hunting Book, printed and entitled as Medieval Hunting Scenes. BTW, Rohan is an actual place, a well preserved small 15th century castle in Bretagne, France. That about sums up my collection right there. Maybe the best source to the 11th century & 1st crusade is of course the Bayeux Tapestry; there are several printed versions of it, including an uncut 1:7 scale model. a big fan of Pieter Bruegel's work as well. 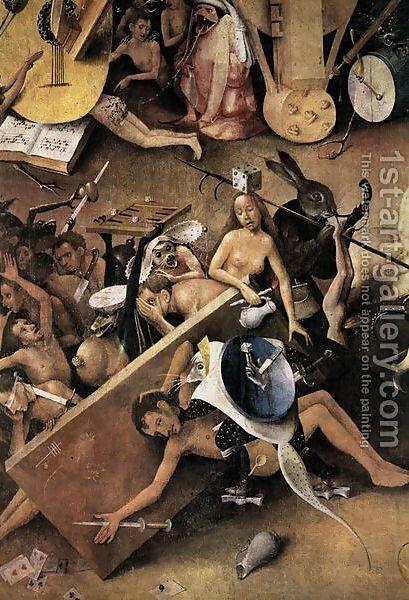 Definitely my favorite of his works is "The Triumph of Death"
here is a close-up of just a small section of this .....several weapons throught-out..